“In 10 sessions, you will feel the difference. In 20, you will see the difference. And in 30, you’ll be on your way to having a whole new body.” – said Joseph Pilates, the creator of the popular exercise system which engages the often neglected muscles, actually essential for the healthy spinal cord. People who take up pilates will improve their posture, relieve pain caused by prolonged sitting e and begin their journey into the wonderful world well-known to Katarina Kuljača, a pilates instructor and educator whose studio “Feel Pilates” is favored by many Belgrade-based people who work out. Pilates as a BODY&MIND technique teaches us how to interconnect them. A conscious movement executed with care is indisputably more efficient and can make a great difference, especially by influencing the way you move. One of the biggest misconceptions about pilates is that the exercises are quite easy and that you can’t grow tired during practice. Katarina Kuljača says that the pilates method is very demanding, but that this is the very reason for its effectiveness. -All the stretching during the sessions is very beneficial, but we focus mainly on increasing strength, so a lot of people are surprised at first when they find some of the exercises too difficult. – Katarina explains. Amongst people who take up pilates there are also men who used to go to gyms, and who walked confidently into the pilates studio to face Katarina, and test themselves to the full extent of their abilities. -Different workouts engage different muscle groups, so working out in a gym is nothing like working out in a pilates studio. A pilates session focuses on stabilizer muscles rather than movement muscles. The range of a movement depends on how stable our body can be while remaining in good posture. – Katarina elaborates, adding that the inner stabilizers are muscles that enclose the spinal cord and ensure good posture and protection from injuries. –These muscles must be strong enough to support the spinal cord. Pilates focuses on person’s natural strength which keeps them stable while moving. Stabilizers are very close to internal organs, and I think they’re usually underdeveloped, especially in men. In Katarina’s personal experience, women often find some of the exercises easier to do than men. Working out is all about stability, and pilates is a great starting point for all other activities. -80% of the people in the world have at least once in their lives felt pain in the lower back. The muscle shield holding up spine must be strong, but in many people it isn’t. By gradually strengthening that belt and doing special, rigorous exercises you’ll relieve your spinal cord and shift the weight onto other muscle groups. In addition to muscles that enclose the spine, there are also other very important parts of the body. We’ll also be strengthening the shoulder area, the gluteus muscles and so on, teaching the body how to distribute strength to multiple, well balanced and equally powerful muscle groups. With this, we’ll also change our way of moving. What people learn in pilates sessions can be easily applied to everyday life – first they start moving differently, and eventually they become aware of their newly-developed muscles. -Proper breathing is an important part of a pilates training. It is the only vital function which we can consciously influence and it represents the best connection between the mind and the body- Katarina adds. -During the practice session we use breathing to help the person working out create the link with their own body. At the end of the session we relax, amongst other things, by using certain breathing techniques. We’re very careful not to waste energy and to focus on the essence, which is strengthening the muscles that later help us with movement. This functional training is great for the modern man, affected by constant sitting, and ensures that they do does something good for their spine. Improvement can be seen after a short period of time, which helps impatient people or those who suffer from chronic lack of free time. Katarina recommends sessions 3 to 4 times a week, although she says it’s better to exercise at least once a week than not do it at all. -My advice to everyone is: don’t miss sessions and don’t give up. The most common excuse is the lack of free time and there’s nothing we can do to help with that, but we can achieve excellent results in small groups and through personalized approach. Everyone works out to their own rhythm and shouldn’t look at others during training. Some middle-aged women can do much better than their younger classmates, and we also have some 65-year-old ladies who work out with great vigour. Pilates helps you tone quickly and it doesn’t have a competitive streak, everyone does as much as they can while staying in control of their own body. We work out to music, but the first session is always carried out in silence and with no mirrors, thus helping people focus and keep in touch with their bodies. You need to feel your body to really get to know it. Katarina was once rather passive herself. When she wished to replace her desk job with something different and more creative, she completely changed her lifestyle and habits. Back then she took up pilates as a mere hobby, but today it is her profession in which she constantly advances. She’s working with a Sacramento-based company called Balanced Body, which holds Pilates on Tour, the travelling seminars for pilates instructors with some of the best experts in the area as lecturers. 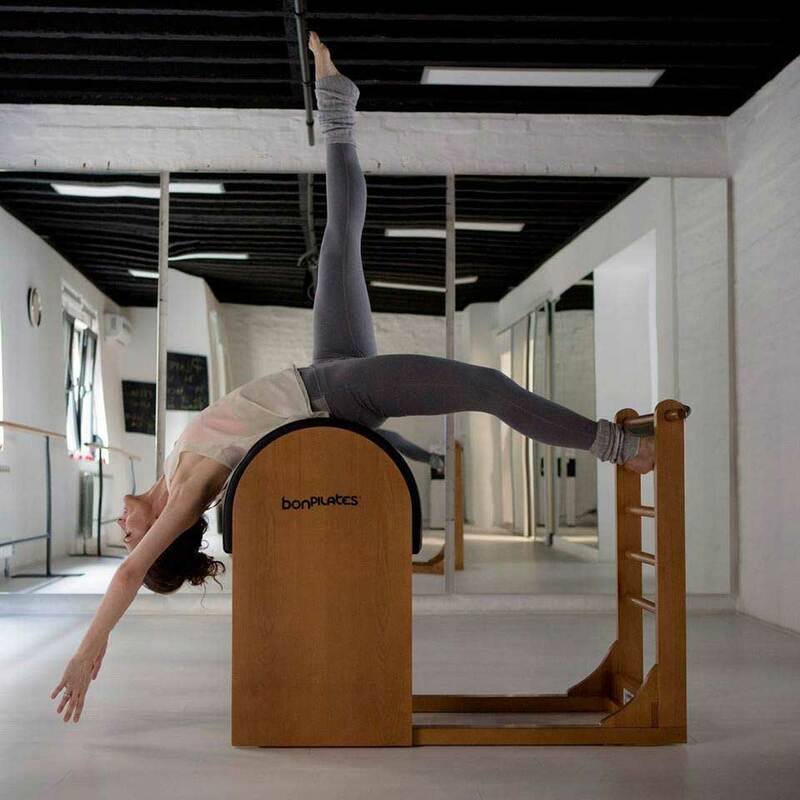 Last year in London, Katarina completed training for the Balanced Body Barre method, an exercise system inspired by ballet. At the beginning of this year, she got the license to train other instructors, and all her lessons are based on using pilates training equipment. -The pilates exercise machines are as old as the method itself, Joseph Pilates having developed both simultaneously. They support this method of exercise and ensure that users keep the proper posture, and they’re designed mainly for people with medical issues, but also for those who see pilates as a challenge. They’re ideal for beginners and we encourage newcomers to use these contraptions. Good posture is intertwined with pilates and these exercises are all about control, which is why Joseph Pilates named them Contrology. Every pilates exercise starts with taking control over the body. Katarina states that the mind kickstarts everything else and that the body does as the mind commands. It’s crucial to trust your instructor in order to achieve maximum results during the workout. -People who suffer from spinal disc hernia are in the separate category, and I was one of them since the age of 16. Now I walk, sit, bend and move in a completely different way. I’m very familiar with the depressing feeling of not being able to move or even get up. Once they recover, some people with this condition choose to take up pilates. They may have difficulties during the first sessions, but it’s very important for them to believe that they won’t recover without moving. The biggest challenge for them is to trust in their instructor, and people with problems in the spine are advised to have individual sessions. Being in control in your own body isn’t easy, but with pilates it is achievable. During pilates sessions people learn to use various muscles they’ve never used before, and Katarina claims that some of the biggest spine-related issues may be rooted in the muscles and can be resolved through exercise. -I enjoy helping people become aware of their own bodies, and I know many who once had poor control over their bodies and who have since completely changed their attitudes and lifestyles.